Birds Eye is running “Give a bear a home”, a new advertising campaign centred around the brand’s iconic polar bear mascot. Clarene, the polar bear at the heart of the campaign voiced by Willem Dafoe, is known for appearing inside freezer compartments, talking to unsuspecting home cooks about the need for superior products. In the latest campaign the polar bear opens the freezer door and finds mini versions of himself. 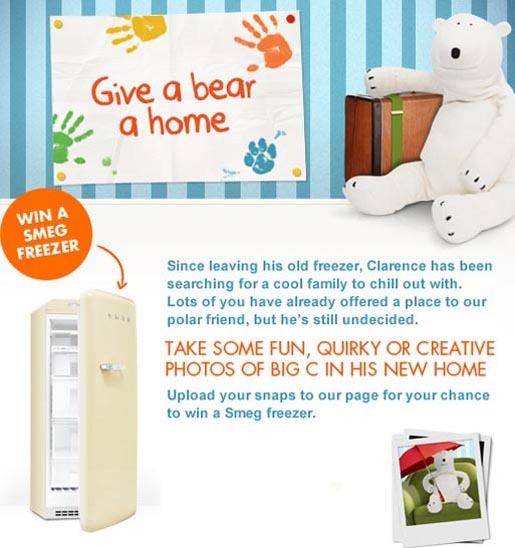 The Birds Eye Facebook page invites fans to make their own versions of the Polar Bear interaction to win a Smeg fridge/freezer. The Polar Bear campaign was developed at AMV BBDO, London, by copywriter/art director Tim Riley, agency producer Paul Goodwin. Filming was shot by director Tony Barry via Academy Films, London. Post production was done at Prime Focus. Sound was designed at Angell Sound. The Polar Bear was designed at Asylum Models & Effects, London.